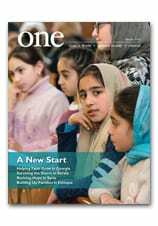 In the June 2018 edition of ONE, writer Mark Raczkiewycz shows how religious sisters in Ukraine are doing more with less and Giving 200 Percent. Here, he offers some additional thoughts. Doing more with the less is the central theme of the convent story. At the outset, I found the topic for this reporting assignment difficult to wrap my brain around because I had never been exposed to religious sisters beyond cursory encounters at church. I researched the different orders and the charisms that define them. In Ukraine, some orders are more than 100 years old. They have storied traditions that are rooted in serving both God and vulnerable groups of society. Some are devoted to education, others to health care, and more to well-rounded child development. In a country of more than 40 million, yet the size of Texas, Ukraine only has about 850 religious sisters serving in different capacities at 21 communities. They’re clearly not in a position to scale up — and it soon because obvious, over three days of reporting, that they’re overwhelmed. There’s only so much they can do that is humanly possible. Their numbers are dwindling so the communities are drawing upon the talents that each sister possesses. Some have two or three degrees of higher learning, including medicine and biological genetics. There are also trained lawyers and psychologists, some of whom have studied abroad in Rome. While the pool of incoming sisters brings women with richer pedigrees than those who entered convents en masse after the church emerged from underground in 1991, they’re no longer clamoring to join an order. Various reasons were given for this — and the church is still doing a deep-dive analysis. The main reason, perhaps, is that youth have more choices than in the past. Temporal values like materialism, consumerism, and individualism take precedence over deeper spiritual values — and they aren’t conducive to that lifestyle. The church is also battling the stereotype that entering a convent is the equivalent of incarceration. It’s simply not attractive to people, so efforts are being taken to change messaging and how people are introduced to the church. Despite everything, the sisters are optimistic. “It’s about quality not quantity” now, said Basilian order superior Mother Danyila Vynnyk, quoting a French truism. To adapt, sisters meet weekly to exchange thoughts on lessons learned — what works and what doesn’t in their communities. This saves time, improves efficiency and avoids duplication of mistakes and waste of human resources. The church also utilizes outsourcing when possible. Lay people are being used to augment the sister’s work — such as teaching the catechism to children. And there is well-grounded hope. Aside from the orders that will inevitably die out because they couldn’t sustainably replenish their numbers after the rebuilding phase of the 1990s, other communities could see their numbers swell again, once the new generation brought up in church life grows of age. Sister Teofania of the Basilian order is one of these. She grew up immersed in church life. Entering a convent seemed like a natural decision to her. “It will be very interesting to see what will become of this generation,” Sister Nataliya said. The Bethany Sisters’ motherhouse in Kottayam is a spiritual powerhouse where temporarily professed sisters spend a few years in prayer, study and work before taking their final vows. Pure and virtuous, the sisters are nevertheless wholeheartedly human and very Indian. They are fully aware of the outside world and eager to go and serve the poor and sick. Today the Bethany community operates some 100 lower and upper primary schools, 65 nursery schools, 28 secondary schools, 3 university colleges, a teacher-training college and several other vocational training centers. Mar Ivanios University in Trivandrum is one of the premiere institutions of higher learning in Kerala, educating more than 3,000 students per year. Ecumenical activities, family visits, catechism, preaching, mission work, care for the sick (the Bethany community runs several hospitals, leprosy eradication projects and preventive health care programs) and care for the handicapped, the elderly and orphaned children are all important apostolates. For more, read Following Christ in an Indian Way. A resident of the Kidane Mehret Children’s Home in Addis Ababa, Ethiopia, studies. Your gift ends up on the table of a family fleeing the violence of Syria. About 240 Christian families have fled the embattled city of Homs, as the situation deteriorates by the day. A parish priest and religious sisters are sheltering them away from the violence. But for as little as $108, you can give a month’s worth of lifesaving aid to one family — aid that offers food and medicine to people in dire need right now. It ends up helping support a sister in India. Maybe she’s a novice, prayerfully awaiting her final vows. Maybe she’s working with orphans and needs textbooks or supplies. A gift from you will go into her hands, and be an investment in a more hope-filled future. In 2011, your generous gifts sponsored the formation of 507 novices studying in India! And for the next 60 days, one of our benefactors has agreed to match any gifts to sisters, dollar-for-dollar, up to $50,000. Such a deal! It will give schoolbooks and a warm meal to a child orphaned by AIDS. Countless children have been left abandoned or alone by disease or war. CNEWA helps provide them with hope, and a future. Maybe it’s medical care. Maybe it’s food or shelter. Whatever the circumstances, your sponsorship invests in their future — and invests, really, in our future, too. It helps bring an end to conflict by actually getting people to talk to one another. Part of CNEWA’s mandate by the Holy Father is to encourage ecumenical and interreligious dialogue. Your gift can support local churches in CNEWA’s world, bolstering their good works, building bridges and fostering understanding and closer ties with all believers. Maybe best of all: somebody, somewhere, will pray for you. And who doesn’t need prayers? All the people you help, and even the Holy Father himself, will raise grateful prayers to God for you. Also, on Christmas Eve, Msgr. John E. Kozar, CNEWA’s president, will travel to Bethlehem on your behalf and celebrate Midnight Mass at the Basilica of the Nativity for your special intentions. Giving to CNEWA is an investment in a better, more peaceful world. We connect you to your brothers and sisters in need. Together, we build the church, alleviate poverty, encourage dialogue, affirm human dignity and inspire hope. Novices pose for a portrait at the mother house of the Daughters of Mary in India. Visit our website to learn how you can double your gift to sisters. Seminarian Philip Chasia and his wife, Mercy, stand outside their one-room house near the campus of the Orthodox Patriarchal Ecclesiastical School in Nairobi, Kenya. All seminarians receive a stipend during the nine months of the year they are enrolled in classes. The sum is paltry, especially for the married seminarians who must support wives and children in addition to themselves. (Orthodoxy permits married priests on the condition they marry prior to ordination.) Because the school does not offer seminarians any part-time job opportunities — something many would like to see changed — the stipend serves as the only source of income for most of them during the academic year. The administration “should try and find a way to assist married seminarians, or they should just take single men,” suggested Mr. [Philip] Chasia, who pays 2,000 shillings (about $29) a month in rent for the thin, metal house he shares with his wife. Utilities are extra. To learn more about this seminary in Nairobi, check out Kenya’s Orthodox Miracle from the September 2008 issue of ONE. “I plan to do pastoral work and I’m preparing myself for the needs of the people,” says Mr. Hassan, a native of Jordan, who attends the Latin Patriarchal Seminary in Beit Jala, a town adjacent to Bethlehem. Not until shortly before noon does Mr. Hassan take a break from his duties and rest a little before tackling the three–hour drive back to the seminary. For more from this story see, To Be a Priest in the Holy Land. The process can take as little as five months or as long as 15 years — there is no set period. But three years is typical, Father Giorgi said. But, as the picture shows, there is room for pets. Read more at this link.